Very Far Away from Anywhere Else, by Ursula K. LeGuin. It's the story of Owen, a smart seventeen-year-old who's slowly being forced toward a grown-up life that he's not sure he wants; and his relationship with Natalie, an equally smart girl who knows exactly what she wants -- to be a composer -- and is working hard to get there. It's a slim little book (fewer than 1o0 pages) about soulmates, the difference between friendship and love, the transition from childhood to adulthood, feeling different, losing and finding hope, those rare and perfect moments that make everything worthwhile. I love this book so much that when it was out of print, I went to the New York Public Library and copied every spread on the copy machine just so I'd have the text for myself. There's very little story to it, and it's not for everyone, certainly, but if you were a "sensitive" teenager who loved reading and thinking and felt a little out of step with everyone else, THIS IS THE BOOK. It's criminally underknown, but Michael Stearns, bless him, brought it back into print while he was at Harcourt, so it's still available in stores. Read it and give it to any thoughtful teens you know. Crossing to Paradise by Kevin Crossley-Holland -- The three books of Kevin's Arthur trilogy were on the indie Top Ten list, ALA Best Books et al., and highly praised by Philip Pullman and Karen Cushman. This pendant novel stands alone in its story of another character's pilgrimage to Jerusalem, but it also rounds out Arthur's story; and the writing in it is so, so gorgeous and poetic. . . . It's a wonderful gift for any reader interested in the Middle Ages, Jerusalem, pure faith, or again, lovely writing. The Book of Everything by Guus Kuijer, translated by John Nieuwenhuizen -- the only atheistic children's novel I can name is also one of the most joyous, rich, and strange books I've ever read, a book that literally changed my life with its protagonist's simple answer to the question of what he wants to be when he grows up: "Happy." Because that's what it's all about, isn't it? The Slightly True Story of Cedar B. Hartley (Who Tried to Live an Unusual Life) by Martine Murray -- Seven years after we published this, I still think about its definition of love, its delicate and original imagery, its wonderful main character and her quirky family, and give copies only to people who I deem worthy to know it. . . . This one is truly a Book of my Heart. The Singer of All Songs and its two sequels (The Waterless Sea and The Tenth Power) by Kate Constable -- The first of these came out in 2004, I think, right in the middle of the early-00s YA fantasy glut, and I think they just got overlooked. Which is an enormous pity, as they're beautifully written, highly original fantasies that are perfect for any fans of Tamora Pierce (who blurbed them), Robin McKinley, or Elizabeth C. Bunce. Absolutely Maybe by Lisa Yee -- I daresay this was the best food YA novel of 2009 AND the best Los Angeles YA novel of 2009, a testament to Lisa's love of the city and really great tacos. It's also a great coming-of-age story with a terrific supporting cast. Thanks for reading! And now -- go read the books! Congratulations to Francisco X. Stork for winning the Schneider Family Award - Teen division for MARCELO IN THE REAL WORLD! To quote the ALA website, "The Schneider Family Book Awards honor an author or illustrator for a book that embodies an artistic expression of the disability experience for child and adolescent audiences." MARCELO, of course, is about a young man on the autistic spectrum, among many other things, and everyone at Scholastic is thrilled the committee saw fit to honor it with this important award. And then MORIBITO II: GUARDIAN OF THE DARKNESS was named a Mildred L. Batchelder Honor Book! The author of the book is Nahoko Uehashi, the translator Cathy Hirano; and of course the first book in the series won the Batchelder last year. Congratulations again to them, and thank you to the committee -- it's an honor and a pleasure to have our AALB commitment to translation recognized once more. Hooray for all today's award winners! A few years ago, my dear friend Katy gave me the best pair of gloves any story-lover could desire. This year, Gbemi Rhuday-Perkovich came through with my favorite editorial present. 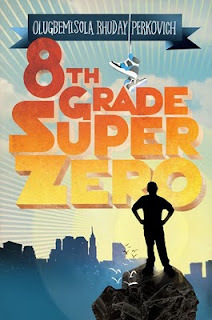 In her Eighth-Grade Superzero, one of the characters takes "THE GODSON" as his D.J. name ("It's like 'The Godfather' -- junior division -- 'Godson' -- get it?"). When I hit this line while I was line-editing, I loved it so much that, in a fit of editorial goofiness -- which, my authors can attest, come over me fairly often -- I wrote my own D.J. name in the margins for Gbemi's amusement. 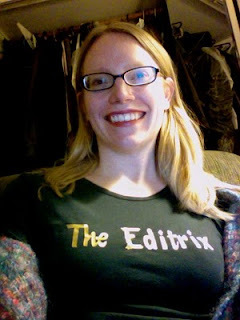 And thanks to this awesome shirt she made for me, now the world can know . . . I am . . .
You know, this may also be my professional wrestling name. My motto: "Look on my works, ye mighty, and despair." Because quoting Shelley is how I roll, as The Editrix. Hee. For the New Year: "Finishing the Hat"
The title of this post relates to two things in my life in 2010. The first is that it's the title of the first volume of Stephen Sondheim's memoir, which is the book I'm most looking forward to reading (besides those I work on, of course) in the new year. And the second is that it's one of Sondheim's most rich and gorgeous songs, about making art, the sacrifices it can require, and yet its dizzying pleasure . . . the last two lines, sung right, always make me catch my breath for a moment. Here's good wishes and inspiration to all of us looking to start, create, or finish our own hats in 2010. Yes, she looks for me--good. As I always knew she would. I had thought she understood. You can say to yourself, "Well, I give what I give."